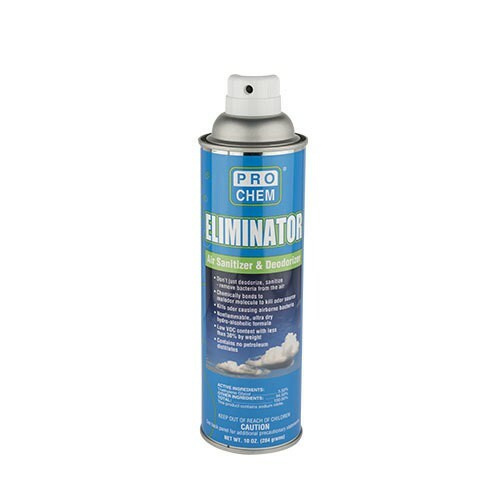 ELIMINATOR | Pro Chem, Inc.
ELIMINATOR eliminates odors by killing odor-causing bacteria from the air to cleanse the air you breathe. As a deodorant, the next generation odor-counteractant system chemically bonds with the malodor molecule, destroying the odor source instead of just covering up or masking it. Odors from mildew, smoke, vomit, feces, urine and putrescence emitting are effectively eliminated with this product. The advanced, low VOC chemistry is hydro-alcoholic with no petroleum distillates or hydrocarbon propellants. The ultra-dry spray has little fall out. 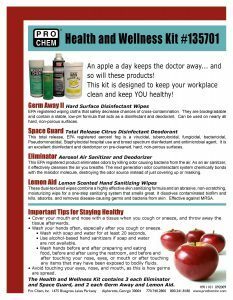 Frequent use will provide refreshed, pleasant air all day that is not just deodorized but also sanitized by reducing odor-causing bacteria. To temporarily reduce airborne bacteria and eliminate odors, close all air sources as well as windows, doors, and vents and spray for 10 seconds for an average room (12’ x 12’ x 8’). Relative humidity should be 45-75% for maximum effectiveness. Reopen air sources after 5 minutes or after mist has settled.